The July 2012 issue of Tabletalk features tackles the questions of why sound biblical doctrine matters, why we cannot compromise, how we determine our doctrinal boundaries, and how Christians can avoid succumbing to the temptation of wavering. In this technological era, anybody has the ability to disseminate their beliefs about critical religious doctrine through numerous modes of media. Further, Western culture vehemently affirms the validity and veracity of each stance. Yet, the Word of God teaches differently. This issue examines the importance of maintaining and guarding doctrinal integrity for the sake of the gospel. Contributors include R.C. 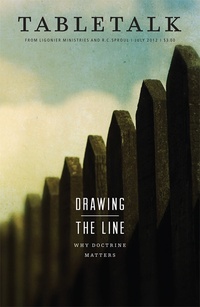 Sproul along with Tom Ascol, R. Scott Clark, Kevin DeYoung, Dan Dumas, Sean M. Lucas, Keith Mathison, Star Meade, Andrew Naselli, Carl Trueman, and R.C. Sproul Jr..